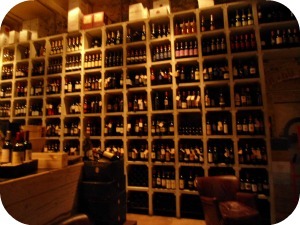 An enoteca in Florence is a perfect spot to try a variety of wines while enjoying specially prepared Italian recipes. Enoteche serve both traditional Tuscan dishes as well as more original and creative meals. The main criteria is that each recipe is carefully selected to perfectly compliment the wine that the dish is matched with. Spending an evening at an enoteca makes for a lovely night out, and if you're a wine lover, it's really a must. The great thing about enoteche is that the wine is served by the glass - even the highest caliber of wine - so that you get the chance to taste as many types of different vintages and varieties of wines as you like. You can enjoy this type of meal even if you're not an expert - in fact, this is the perfect way for a non-connoisseur to get familiar with wines since it's the enoteca that advises you about which wines to drink with each course of your meal. Piazza del Vino is a cross between an enoteca and a (very special) restaurant. 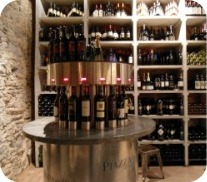 Firstly, there are over 600 types of wine which you can select and taste on your own at the enoteca's wine machine. The machine (see photo above right) lets you purchase samples of different wines, just paying for the bit you drink using a re-chargeable card. Note: Piazza del Vino serves ONLY wine and water, no other beverages (sorry beer lovers or soda drinkers!). The menu is a map of Italy, and each dish comes from a different region of the country. 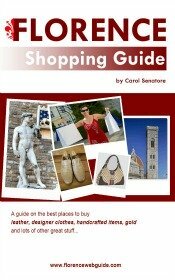 You can try a Florentine steak, or a Sicilian fish dish or a Milanese risotto, and the list goes on. Every time I have eaten here the food I ordered was absolutely delicious. The atmosphere is like a chic modern tavern, stone walls and thick wooden tables with modern lighting and steel finishings. Somewhat elegant but not stuffy.